Hiking is a hugely popular pastime in Korea, with 32 million of the 51.6 million population said to visit a mountain at least once a year. Hiking’s popularity, and older generations’ apparently love of hiking attire for everyday activities, has led to a massive market for “outdoor” clothing, peaking at over 6 trillion won ($5.2 billion) in 2014. The popularity of hiking also comes with a downside. The sheer number of hikers comes with environmental concerns, especially with trash left behind by hikers as well as by local governments’ projects to attract more hikers. Regardless, the activity is still one of the most popular and accessible leisure activities in Korea, one that is attracting younger generations. Yet amid the more mature hikers, larger and larger numbers of young people appear to be discovering the charms of hiking. On the internet, tens of thousands of those in their 20s and 30s have joined online hiking communities that strictly limit the ages of its members. Hiking was once on the list of least favorite activities -- even a traumatizing childhood experience for Jung Na-eun. But now she believes the mountainous terrain surrounded by nature is worth the strain of climbing the hills. “When you look at the beautiful scenery on the mountain, you lose count of time. I love that. I would walk up the mountain for 40 minutes without knowing the time and it is not tiring at all,” Jung, 31, told The Korea Herald. Rayjun Lee, who has been operating an online community for hikers in their 20s and 30s since 2011, explained it is down to growing interest for active sports and leisure activities among the age group. “It seems like the range of leisure activities was somewhat limited in the past, but we see much more diversity. For example, surfing nowadays is more popular, but it was not so familiar to find a person surfing even just a couple of years ago,” Lee, 40, explained. Learning the joy of climbing unexpectedly when he was 30, Lee decided to create the online community “Metoo Friends & Hiking 2030,” with only some 10 members in the beginning. Now, more than 9,840 members actively participate and plan hiking get-togethers. Seeking a different hiking culture, Lee also set strict regulations on the meetings and banned excessive drinking in the group outings. While drinking traditional Korean rice wine makgeoli with meals has settled as part of hiking culture for many, Lee specifically wanted to avoid that for a new sort of hiking culture for those in their 20s and 30s. “We often see older people in hiking gear drunk and loud on subways and buses during daylight hours. It was a culture which I did not like, so I set strict regulations against the drinking culture among our members,” Lee said, adding that many young people he observed also prefer it that way. 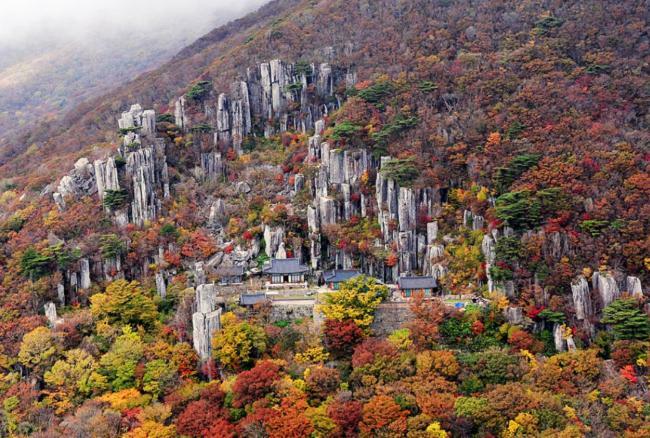 The beautiful mountains in Korea have also gripped young foreign tourists’ interest. Cheyne Chen, a Singaporean who has included hiking Korean mountains in both of her two trips to Korea, said the mountains in Korea were more challenging than what she could find in her home and neighboring countries. When Chen, 30, visited Namsan on Tuesday, she said she noticed there were a lot of people over 40 on the mountain. “Younger people were seen taking buses and cable cars to go up, and the people that were walking up the slope were mostly older. They looked very experienced and were fully equipped with gear and mountain clothes,” she said. Chen also climbed up South Korea’s highest peak, Hallasan on Jeju Island, in her first visit in 2016. Her motivation for hiking is to get out of city life and challenge her body, she said. “Hiking is therapeutic. When you climb the mountain, you focus on the action of taking the step and not think about the things that gets you weary in the city,” she said. As a Singaporean, and having the experience of working at a resort on Mt. Rainier National Park in the United States, Chen explained that the widespread impression of hiking in other countries appears to be different from Korea. Ji Jung-hyun, an office worker in Seoul who enjoys occasional hiking on weekends to escape city life, echoed Chen’s view. “Because Korea is mostly urbanized, many young people are brought up in cities with a lot of buildings and not much nature,” Ji, 26, said.